it is something of an intriguing juxtaposition that individuals such as musicians and sportspersons can find themselves in two different situations either simultaneously or sequentially. my best illustration of that of which i speak is perhaps robert millar. for those who have watched the high life you will undoubtedly recall the scene where robert, sat in the tailgate of a team car, all but ignores a hapless journalist less than eagerly attempting to question the scotsman as to his prospective fortunes in the 1985 tour de france. robert's distinct lack of conversation provides an atmosphere that could almost be cut with a chainsaw. however, look at it from robert's perspective. he has just completed a mountain stage of the tour in which he is faring considerably less well than in 1984. his job is to ride his bike, to win stages or jerseys and ultimately to represent his team and sponsor to the best of his ability. he signed up to be a bike racer; shooting the breeze with intent journalists quite possibly wasn't part of the job description. musicians can also find themselves in a similar situation. having practised diligently for years, they have finally found themselves in a musical situation that is offering not only musical reward, but more than reasonable financial compensation to boot. traipsing round radio and tv stations promoting their latest album or concert or spending most of the day enetertaining the often inane questions posed by a series of journalists was never mentioned in the handbook. watching from the sidelines as interested parties, we must surely be forgiven for not crying into our ipads. particularly if the sportsman or musician in question earns more in a year than any of us will manage in a lifetime. don't they realise that we are the very people who helped put them there in the first place (well, sort of)? don't they at least owe us a few civil and considered answers? it's a yes and no situation, depending on the personality of those being cornered by the media. fortunately, there are those who transcend such situations, either by dint of their personality or by having a distinct proclivity to examine factors well outside their original or current remit. marry the latter to an innate ability for public speaking with a tinge of humour and our hero worship starts to become requited. 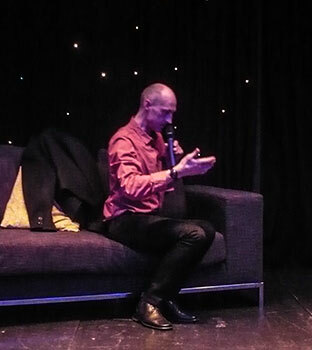 which is precisely why any evening with graeme obree is an event that really ought not to be missed even by those who have little or no idea who the heck graeme obree is. 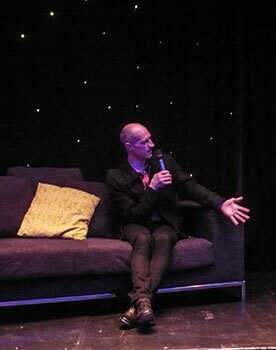 in order to remedy the possibility of such a situation occurring in the first place, wednesday evening's audience with graeme, in the attractively bluish surroundings of edinburgh's, commenced with a three-minute film encapsulating graeme's not inconsiderable sporting achievements in the field of cycling. 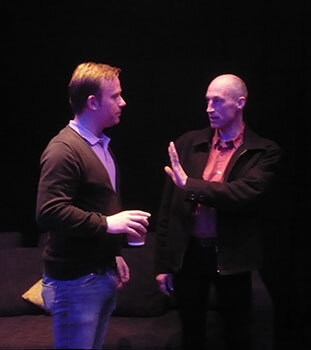 this was immediately followed by an interview with mr obree by gary fairley and graham farr, the two clever brains behind the late lamented (whatever they might say themselves) velo club don logan podcast. as averred in the introduction, if we'd simply wound graeme up and let him go, we'd all still be sat in the corn exchange even now. 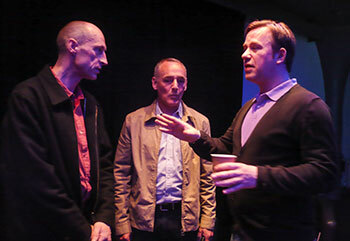 the tag-team of interviewers kept graeme pretty much on track and to the pre-arranged time schedule. the day had not started well. to join the audience on wednesday evening, i had need of travelling on stagecoach's x77 service between ayr and glasgow, a bus that scarcely made it onto the kilmarnock bypass before it broke down. thankfully it took only twenty minutes to send out a replacement and get us all to glasgow's buchanan bus station around 30 minutes behind schedule. having subsequently reached edinburgh's haymarket station, my google maps guide to walking from the station to the corn exchange had mislabelled dalry road as dalry place, leading me to believe i had misread my route. once sorted and underway, i took a wrong turning, adding several minutes to a walking route that wasn't as short as the map had led me to believe. but i did find the corn exchange in time. one pointed question asked of the flying scotsman was just what it felt like to ride the hour record on the sunday after his failed initial attempt at hamar in norway. "You know those boilers that you see in old movies, where there's steam pouring from every seam and the dial on the front is bouncing well into the red section, threatening to blow at any minute? Well, combine that with the gasping for air you'd experience when school bullies held your head under water, letting you surface at the last minute. That described the first three laps. And then you see a sign that says 'only 207 laps to go.' i believe eddy merckx simply exited with a pained look on his face. describing man's two best inventions as "...the bicycle and the duvet", graeme covered such topics as nutrition and hydration ("What we used to call eating and drinking." said gary from vcdl), innovation from the kitchen of a one-bedroom flat in saltcoats and perceiving the bicycle from the unknowing perspective of an alien. the evening concluded with a series of questions from the floor, all of which graeme answered with conviction, humour and an insight that you'd scarcely find in a post soccer match interview. after all was over, graeme was happy to pose for photos and sign autographs in the bar of the corn exchange (his strongest tipple all evening was coffee) after which i walked the two miles back to haymarket station. only this time i didn't take any wrong turnings (thank you google). 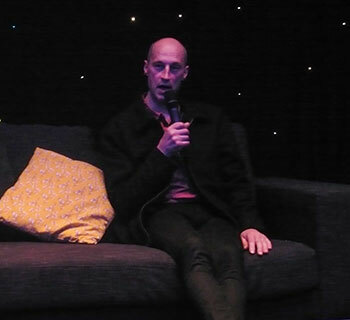 i extend my thanks to organiser rowan mackie, graeme's manager charlie milarvie, gary and graham from vcdl and to graeme obree himself for an excellent and enjoyable evening. this formed part of the advance guard for the edinburgh cycle fest which also takes place in the edinburgh corn exchange over the weekend of 19/20 september this year.